Back in February, 6sqft reported that the Union Carbide Building at 270 Park Avenue–currently the JP Morgan Chase headquarters–was set to be the largest intentionally demolished building in history when plans move forward to replace the 700-foot-tall structure with a tower that will likely rise to over 1,200 feet. 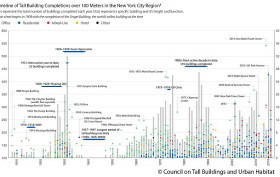 ArchDaily brings us a study done by the Council on Tall Buildings and Urban Habitat (CTBUH) that looks at the 100 tallest buildings ever to be demolished by their owners. 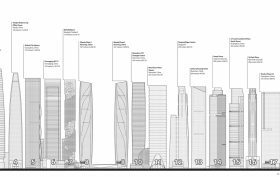 The study, aptly titled, “Tallest Demolished Buildings,” confirms that if the current plans move forward, Skidmore, Owings & Merrill’s 270 Park Avenue would indeed become the tallest to go down–and the first over 200 meters in height. 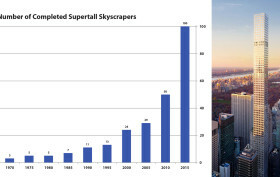 As of December 23, when the slender 1,396-foot-tall 432 Park Avenue condominium tower was officially pronounced complete by the Council on Tall Buildings and Urban Habitat (CTBUH) as the building was “partially habitable,” it became the world’s 100th supertall skyscraper (h/t TRD), categorized as those at least 984 feet in height. In addition to being the world’s tallest all-residential building, 432 Park Avenue is also the world’s 14th-tallest building overall and the city’s seventh supertall skyscraper. In fact, New York has the second-highest number of supertalls on the planet.